Reason enough for me to put together a little collection of a few interesting pieces that I encountered while browsing the web recently. These are some great designs for 2014 and beyond. May your sofas live happily ever after! The first shot features the Lagos modern design coffee table by Beliani. With its simplistic style it reminds me a lot of ZEN inspired designs. White lacquer forms the main part of the table, a walnut finish is sandwiched in the middle. A sleek rectangular shape that floats about an inch above ground. The table provides ample storage in the hidden drawer; the middle part slides out to the side. This table would be a great complement to modern sofas. Archipelago is one of the stunning tables created by Emmet Rock. 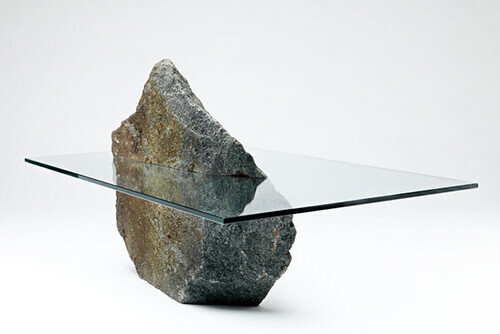 A large stone is wrapped by a glass table top. It’s a delicate arrangement between two materials, raw and natural on the one side, clean and simple on the other: a modern design that begs us to question aesthetics through unconventional forms and shapes. The Cocoon Coffee Table as designed by Clayton Tugonon is a handcrafted resin mold with rattan core. The round shape is reminiscent of a doughnut. Instead of a hole, there is a surface that serves as the table top. 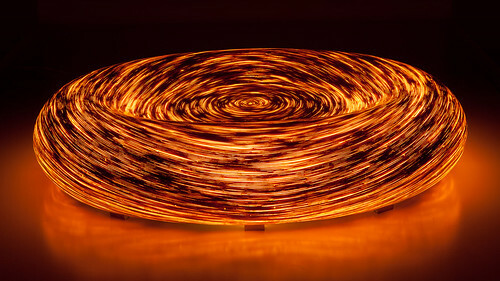 This designer piece has a light source on the inside, making it the absolute highlight of the modern home when lit up at night. The table seems to provide the living room with a glowing beam. The unique round is carried by stainless steel feet. It is available at All Modern for around $3600 retail, a rather pricey option but stunning. This one is called “The Eye of the Universe”. If you were thinking $3600 is out of reach, how about $25K for this one! Merry x-mas to those of you who can afford it. Everyone else, shop with Beliani for modern sofas and coffee tables. You will be just as happy!